After 32 years of canoeing rivers in Ohio and camping pretty much where I wanted, Algonquin was a bit of a culture shock. As I mentioned in an earlier post, there are designated campsites. You have to pre-register with the Ministry of Keeping An Eye On You and you’re obligated to be on whatever lake you say you’re going to be on that night. Beyond that, you have to fight it out for the best campsites. There’s a lot of strategy involved, such as getting up early enough in the morning and heading to the next campsite so you beat everyone else there. Or getting up late at night, sneaking into someone else’s campsite and setting their canoes adrift. Make sure they don’t have dogs with them. It’s a good idea to take a dog along if your camping in Algonquin, especially if the dog belongs to a neighbor and you don’t particularly like it. You see, there are bears in Algonquin. And, since this is Canada, you’re not allowed to take a gun. A bear is more likely to go after a dog that doesn’t have the sense not to bark at it. On rivers in Ohio you can leave your cooler out at night and your non-refrigerated food if it’s in a reasonably secure container. Not so in Algonquin. You have to rig up a bear rope, which is slung over a tree to dangle food containers high enough off the ground that bears can’t reach them. Of course, bear ropes are prone to snagging and people have been known to starve to death out there because they can’t get at their own food. But Ken and Steve are experienced bear rope riggers and we didn’t have any problems. 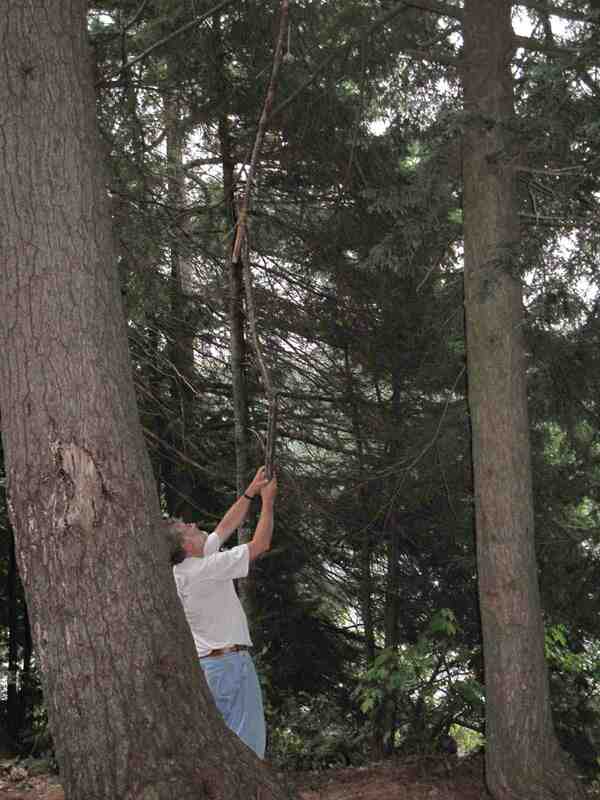 In fact, Ken managed to retrieve someone else’s snagged bear rope at our Penn Lake campsite. I’m not sure how he did it because I was in my tent napping at the time. Steve said he fell out of the tree three times. I heard one thud but must have slept through the other two. 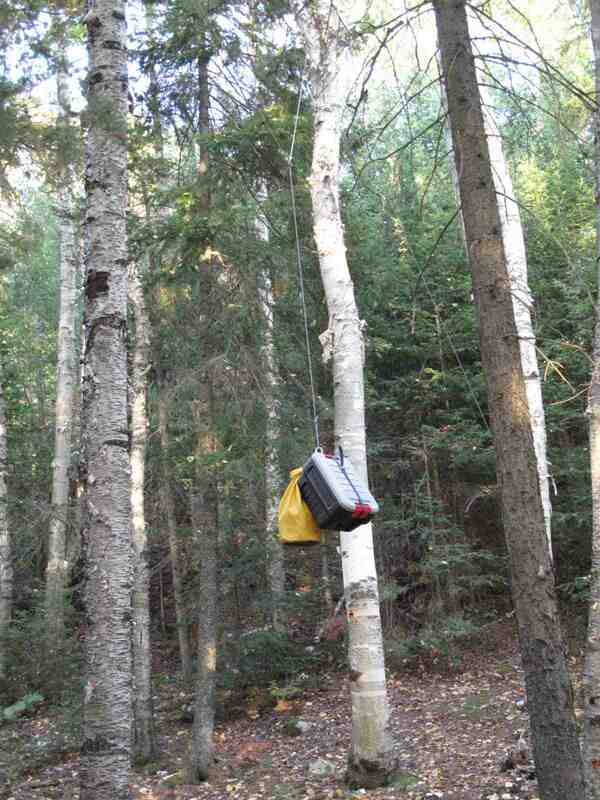 Moving on to an indelicate subject, in Algonquin, they have something called boom boxes. They don’t have speakers the size of your head or knobs. They’re just wooden boxes with lids and, if you were to lift the lid, there’s a toilet seat. The long and short of it is everyone goes at the same spot in a shallow hole all summer long. 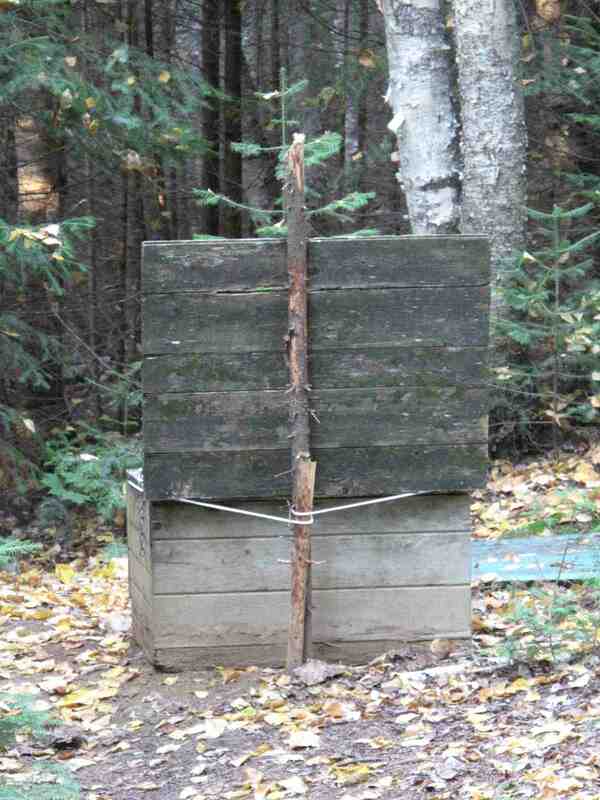 When canoe camping back home, I take a trowel and a roll of toilet paper and trudge off into the woods. At Algonquin, I took a trowel and a roll of toilet paper and trudged off into the woods. I’m probably in violation of some Canadian law, If so, I’m not sure what the statute of limitations is. Or whether this confession would hold up in Canadian courts. Let’s see them back it up with circumstantial evidence. Don’t forget DNA testing , and the 24 pictures with circles and arrows an a paragraph on the back explaining the evidence !